THE LARGEST GATHERING OF BASKETBALL COMPETITORS OUTSIDE THE TOURNAMENT. 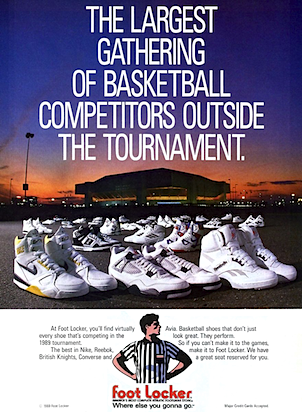 At Foot Locker, you’ll find virtually every shoe that’s competing in the 1989 tournament. Avia. Basketball shoes that don’t just look great. They perform. So if you can’t make it to the games, make it to Foot Locker. We have a great seat reserved for you. Where else you gonna go.